I had the opportunity to do a flower swap with a Inaretha Lategan, a wonderful pressed flower artist from South Africa. Here are two creations from this exchange. Both have been sold. I have been extremely busy with custom orders recently which is wonderful. Here are a few for your viewing pleasure. 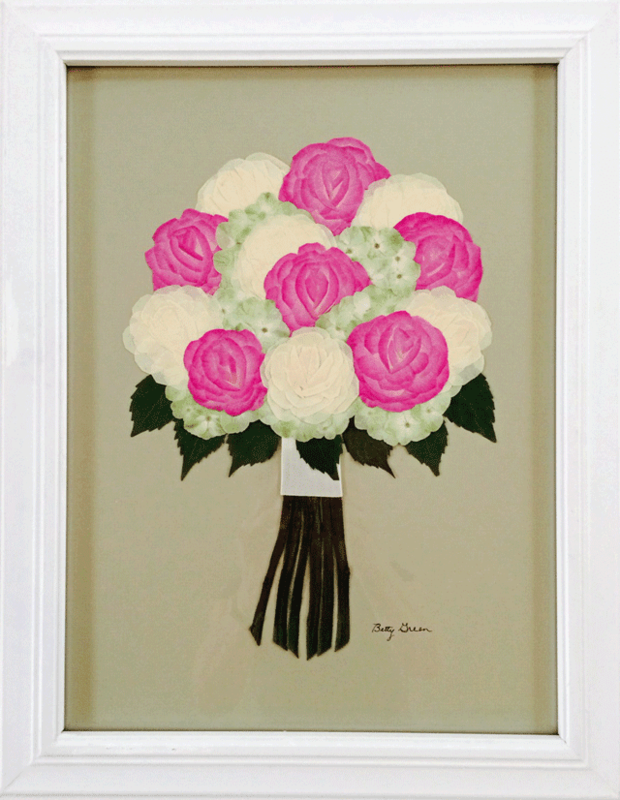 The first two are bridal bouquets and the third is from a series of three pieces using memorial flowers. My customers were very pleased. August 23, 2014 – 1:00 p.m. to 4:00 p.m.
Beginner friendly. Pressing techniques will be discussed. Cost is $20/person and includes all materials. Pre-registration with minimum 50% deposit by Wednesday, August 20th. Minimum four students required to hold the class. 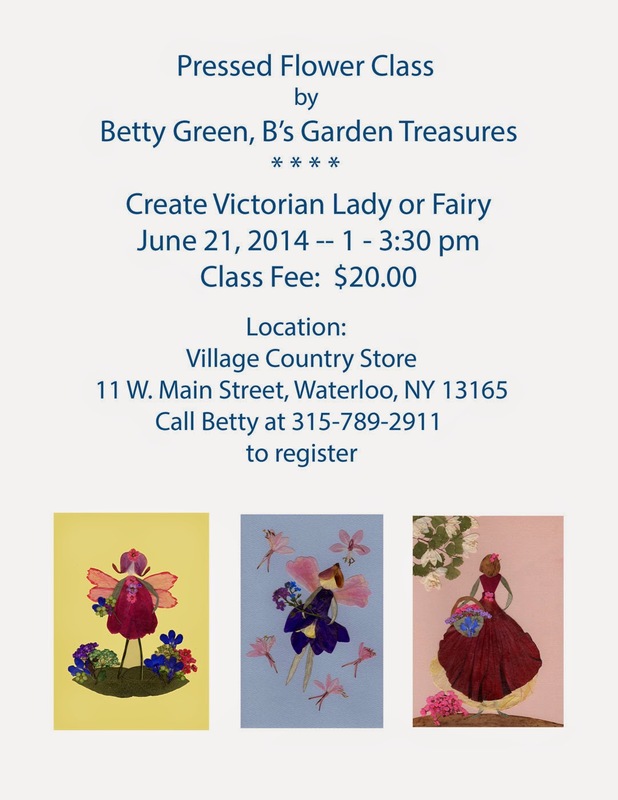 Contact Betty Green at 315-789-2911 to register. My next pressed flower class is scheduled for Saturday, July 19th at the Village Country Store at 11 W. Main Street, Waterloo, NY from 1 to 3:30 pm. Participants will create bookmarks on both a skeleton leaf and a paper background as well as luggage tags adorned with flowers. Pressing techniques will be shared. No prior experience with pressed flowers is required. The class fee is $15 whch includes all materials. Advanced registration is required. 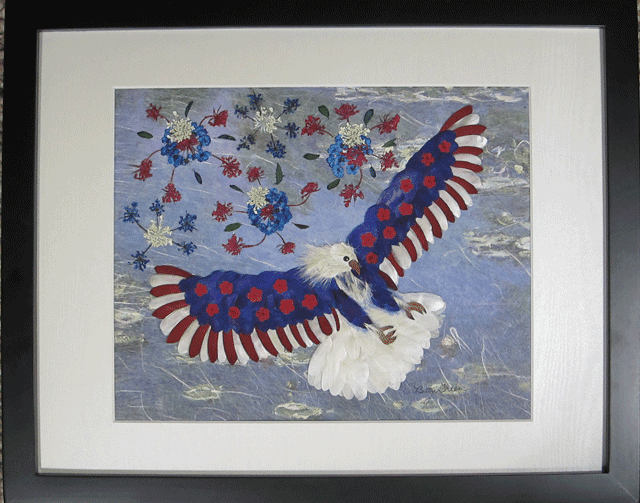 This magestic red, white and blue eagle was created in observance of both Memorial Day and the the Fourth of July. My original concept was to create a flag, but when my research uncovered an eagle, my plan quickly changed. 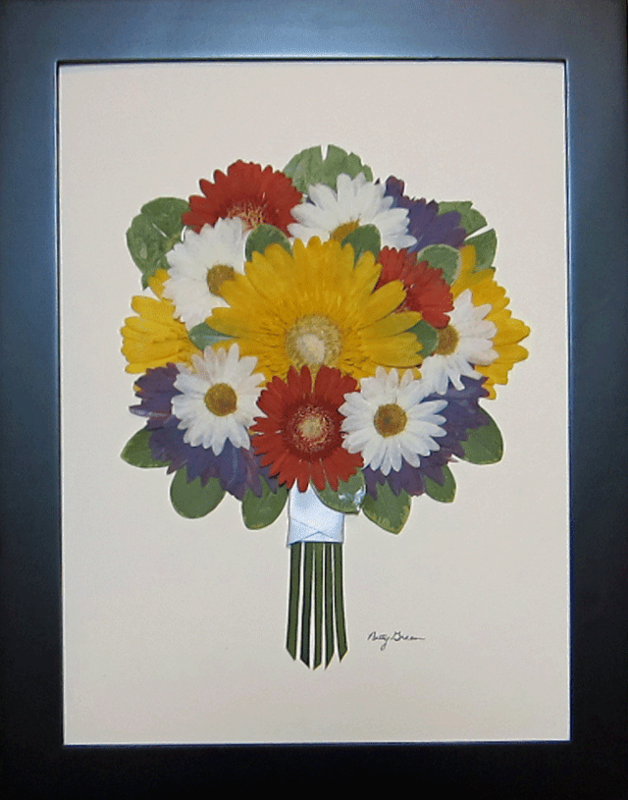 The eagle was created from gerbera daisy, onion skin, delphinium, bark and bridal veil. The fireworks featured bridal veil and queen Anne’s lace. This piece was vacuum sealed and framed with 99% UV acrylic. I recently finished this lighthouse for a family friend. 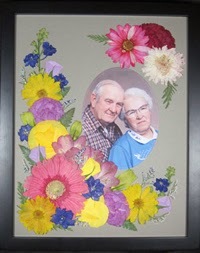 It was inspired from a picture by pressed flower artist, Jacki Harrington. Botanicals included hydrangea, birch bark, banana skin, delphinium, white poplar, red leaves and miscellaneous greens. I hope you like it! This is a busy time of year for pressed flower artists as we harvest new blossoms from the garden. Here are a few of the flowers which I have been pressing. 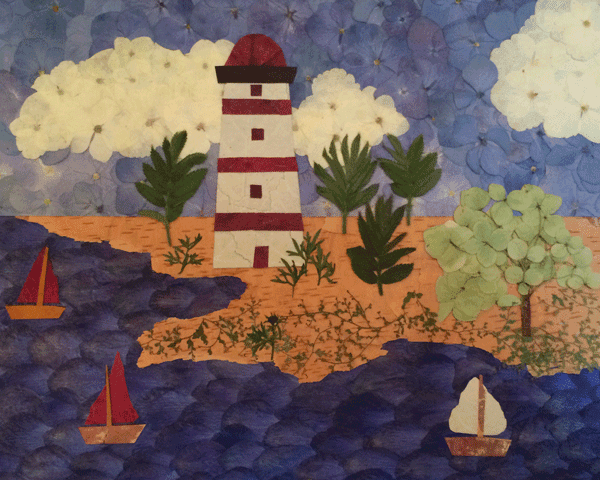 I have wanted to create a pressed flower lighthouse for some time, but I struggled with finding enough flower petals for the sky and water. This was resolved when I decided to use corn husks instead of petals. It was challenging to find suitable dyes which penetrated the husks in realistic colors. I hope you like the end result. Additional botanicals include miscellaneous tree bark, banana skin, coreopsis, grass, maiden hair fern, beehive, penta and miscellaneous ferns and leaves. 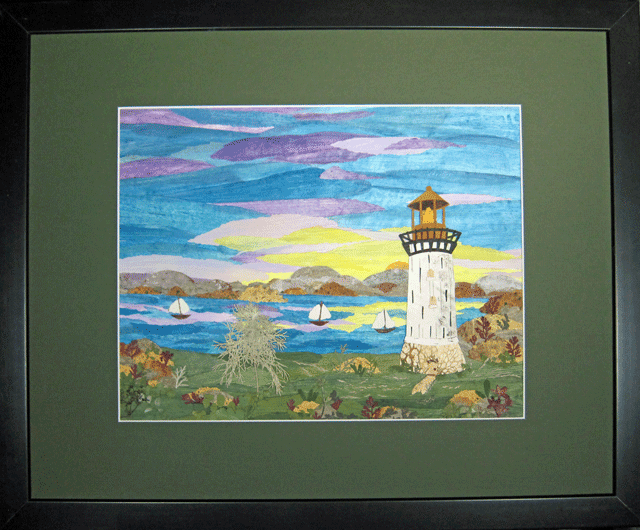 Framed, the lighthouse is 16" x 20" in size and is protected with a layer of 99% UV acrylic. It has also been vacuum sealed. This original was sold at the Keuka Art Festival in Penn Yan. Prints (11" x 14") and 6" x 6" trivets are available. 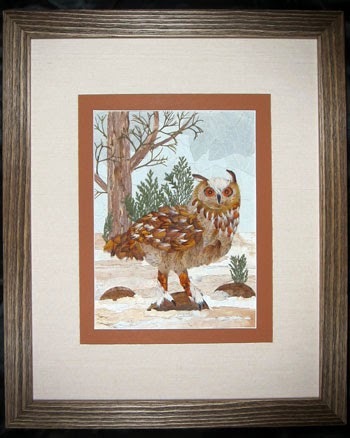 My "Winter Owl" pressed flower framed art has been accepted by the Women Artists of the Finger Lakes: A Contemporary Show & Sale May 29 -- June 1, 2014. This event is hosted by the First Congregational Church in Canandaigua, NY. The owl was created primarily from alstroemeria and crocosmia lucifer petals. The sky was "painted" with different shades of white poplar leaves. For the foreground, I used multiple layers of melaleuca bark which I harvested from a “shedding” tree earlier this year. This bark has many, many layers with different colors ranging from off white to dark brown. The brown bark on the tree also came from the melaleuca tree. Additional botanicals include brown lily leaves, pompas grass blossoms, evergreen, cosmos, banana peel and hydrangea. This piece was vacuum sealed and framed with 99% UV acrylic. It has been framed and matted to 16" x 20". 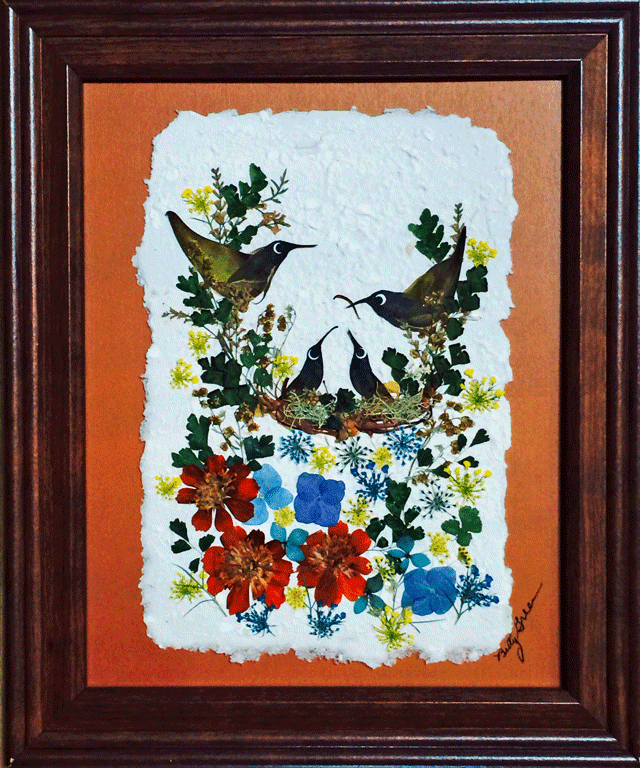 While it did not sell at the Women Artists of the Finger Lakes show and sale, I sold it to a wonderful couple at the July 5-6 CAVAC show in Cazenovia. It will reside in Florida. Prints (11" x 14") and 6" x 6" trivets are available. 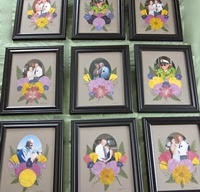 I am happy to share that I delivered 16 pictures to my Aunt using the flowers from my Uncle's service. My Aunt was very happy with the order. I wish I could be there as she presents them to my cousins and their children. The first photo was for my Aunt. 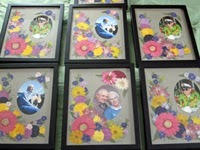 The three flowers in the upper right hand corner were from their 65th wedding anniversary. The rest are for other family members. Can you hear this lovely bird who is deep in song celebrating the arrival of Spring? He was made from ningma and edelweiss leaves, thistle and banana peel. 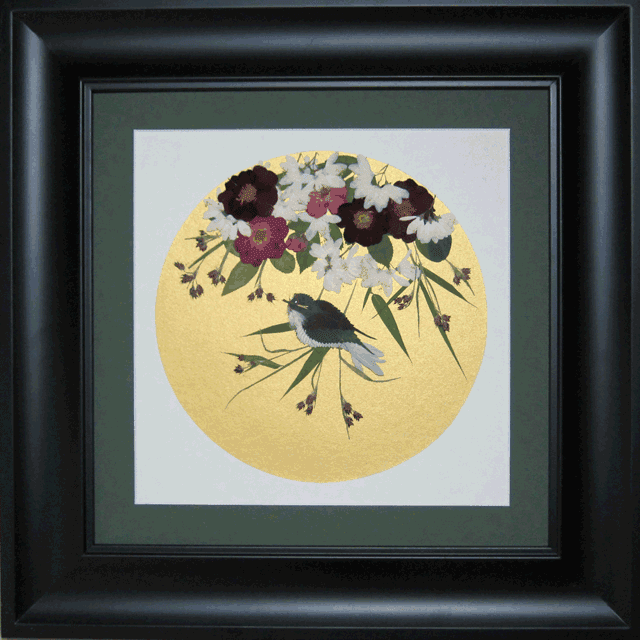 Other botanicals include roses, deutzia, bamboo leaf and field wood rush. 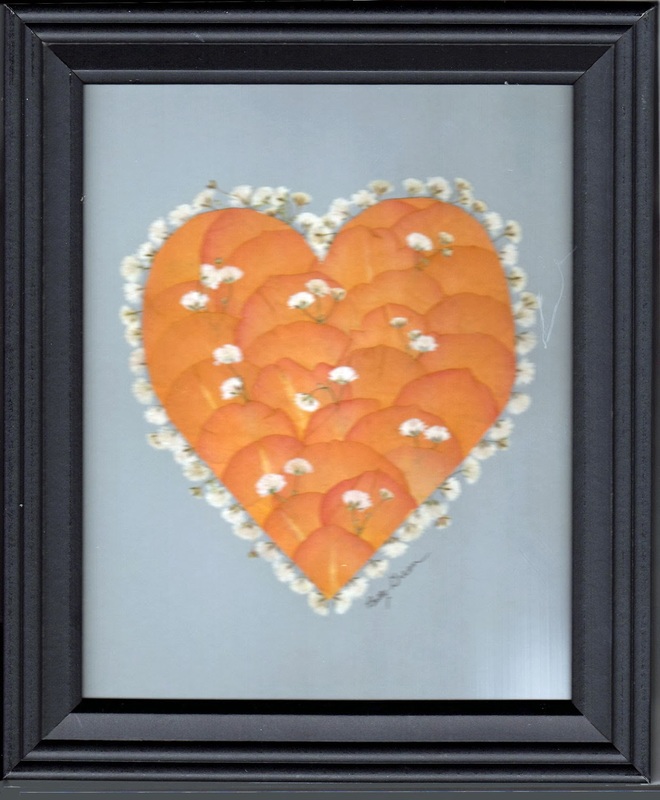 This original 12" x 12" framed pressed flower art has been sold. Who doesn’t love teddy bears? Wouldn’t this look lovely in a nursery or a child’s room? The teddy bear was made primarily from pompas grass blooms which were picked and pressed just as they opened to give the soft feeling of fur. Other botanicals include larkspur, hydangea, baby’s breath, queen anne’s lace, pentas, artemesia, kudzu, ixora and banana peel. 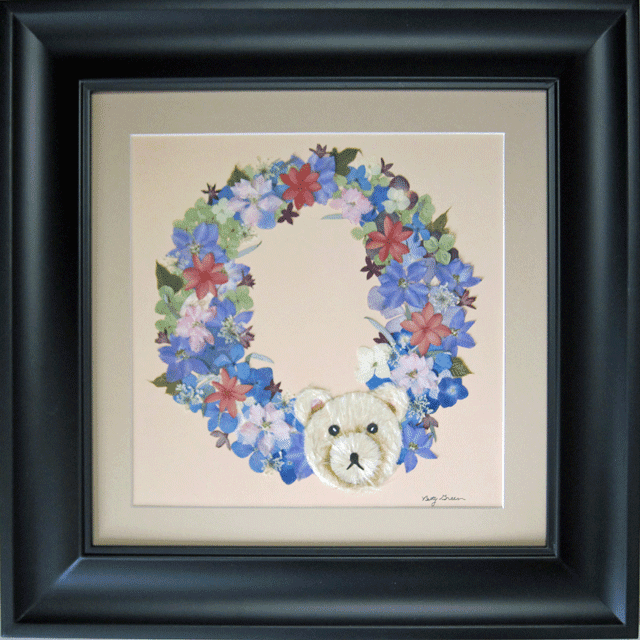 This original 12" x 12" framed pressed flower art has been sold. I expect this rooster will generate a lot of crowing and clucking. He was made from a hollyhock petal base, tiny burgandy flowers which pressed brown, pampas and other ornamental grass blossoms, tree bark and blanket flower. 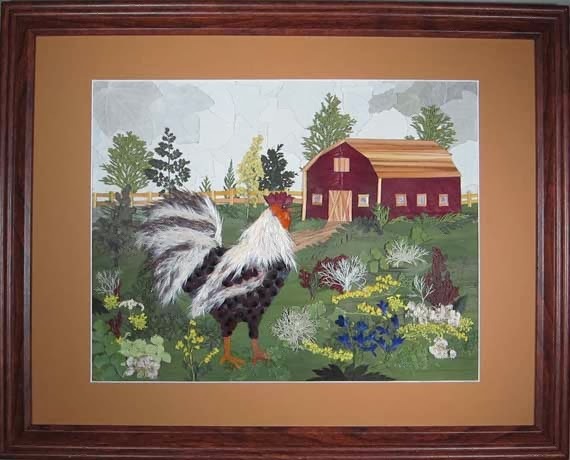 The beautiful barn in the background was made from poinsettia and browned daylily leaves. Other botanicals include numerous ferns, poplar leaves, lily of the valley leaves, goldenrod, hydrangea, lobelia, moss, Queen Anne’s lace, evergreen, yarrow and chamomile. 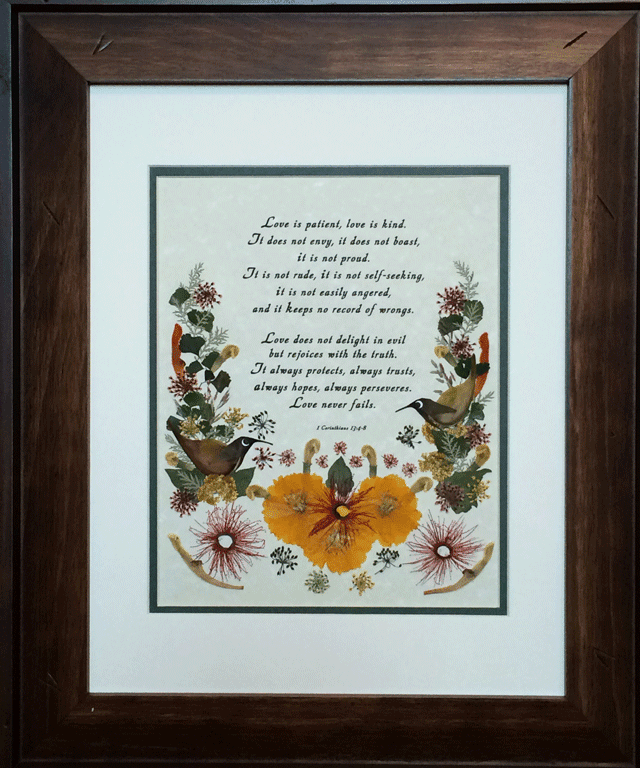 This fancy bird has been vacuum sealed and matted to a 14" x 18" oak colored frame. The matting is mustard brown in color to enhance the browns in the barn and fence. This original piece has been sold. I use a number of techniques when creating my pressed flower bookmarks. In order to make them functional, you must use some type of protection. I normally use hot laminator pouches which are run through a laminator to seal them. You can purchase the pouches in different thicknesses. I normally use 3 mil pouches for my bookmarks but others may use 5 mil. I have also used iron on laminate, such as Drytak or Thermoweb which do not require a laminator. You can also use laminate which uses a sticky background instead of heat to seal the contents (e.g. contact paper or cold laminate). You can find reasonably priced laminators and laminator pouches in craft stores or even Wal-Mart. However, office supply stores have the greatest variety. My first laminator was a Scotch brand. I later purchased a Fellows Saturn 95 brand laminator which was on sale. I like this one better for bookmarks as the paper can be loaded horizontally and is less apt to shift. It is also great to take with me to classes. Many members have purchased Purple Cow brand laminators with good results. I recommend that you look for an option for both 3 mil and 5 mil laminating and the ability to load a full sheet (e.g. 8-1/2” wide). 1) For the best results, use thin flowers and leaves for your design. The flowers can be glued onto cardstock, cut into strips suitable for bookmarks (e.g. 1-1/2” to 2”wide x 5” to 7” tall). You can also add ribbons and/or decorative paper to the surface. 2) Lay out your pressed flower design and glue the flowers to the card stock. Be careful to apply only a small dot of glue to the center of the flower or leaf. Less is better. I like acid free tacky glue (available at craft stores) as it dries quickly. Since it is not water-based, it can be used on most flowers without turning them brown. I use a toothpick to apply my glue. 3) Let the glue dry completely. Sometimes, I will place my “in process” bookmarks under weight to hold the flowers in place until the glue has dried. 4) If using iron-on laminate, cut two pieces to cover both the front and back of the bookmark. Then, cover the bookmark with a soft cloth and apply the heated iron (medium heat) on the surface until the laminate is set. If using Drytac brand laminate, make sure the tiny holes are fully closed. 5) If using laminator pouches, you can place 4-5 bookmarks onto the surface, making sure there is a small space between each one. I apply a tiny dot of glue or 2-sided tape to the back of each bookmark to prevent them from shifting. Run them through your laminator and then trim them to size. When trimming, make sure you leave a small border of the laminate around each bookmark so you do not break the seal. 6) If you sell your bookmarks, you can add a small label to the back before laminating them. I did a Google search on “pressed flower bookmark instructions” and have added some links below for you to check out. Post Note February 11, 2014: The class was a great success. I'm always amazed by the variety of results achieved by the various students when provided with the same material. My next class -- creating pressed flower pendtants -- is scheduled on March 15th at the Village Country Store. -- how to safely store and handle pressed flowers. No prior pressed flower experience is required. To register, stop by the Village Country Store, Main Street, Waterloo NY (Tuesday - Saturday 10 a.m. to 5 p.m.) or contact me at info@BGTreasures.com . All materials will be provided with the registration fee of $20. Payment is due upon registration. The project design is being shared with permission from pressed flower artist, Annie Fentz of The Pressed Garden (http://www.pressedgarden.com/) . I leave for Anaheim, CA on Wednesday morning to attend the Worldwide Pressed Flower Guild Conference being hosted by Kate Chu. Over thirty artists from the US, China, Taiwan, Brazil, and the UK will be participating in this 3-day educational event. The classes include Traditional Chinese Flower and Bird Design, 3D Casting and Pressed Flower Magnets, Pressed Flower Teddy Bear Design, Pressed Flower Garden Design, Pressed Flower Rain Forest, Pressed Flower Jewelry Design and more. 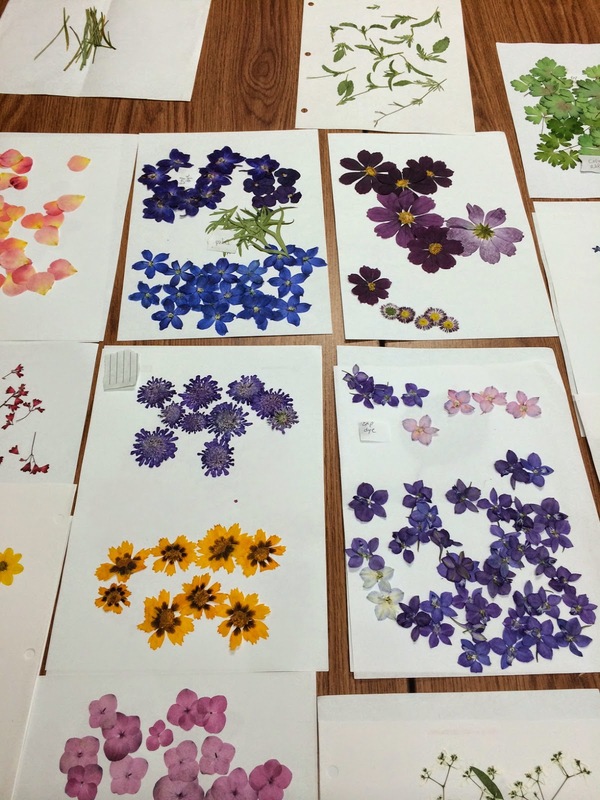 There was also a pressed flower competition and participants will be able to view the amazing art which was entered. There will be some time for sight seeing before and after the conference. I finished a set of three memorial pictures last month. The order came from a dear friend following the loss of her Mother. 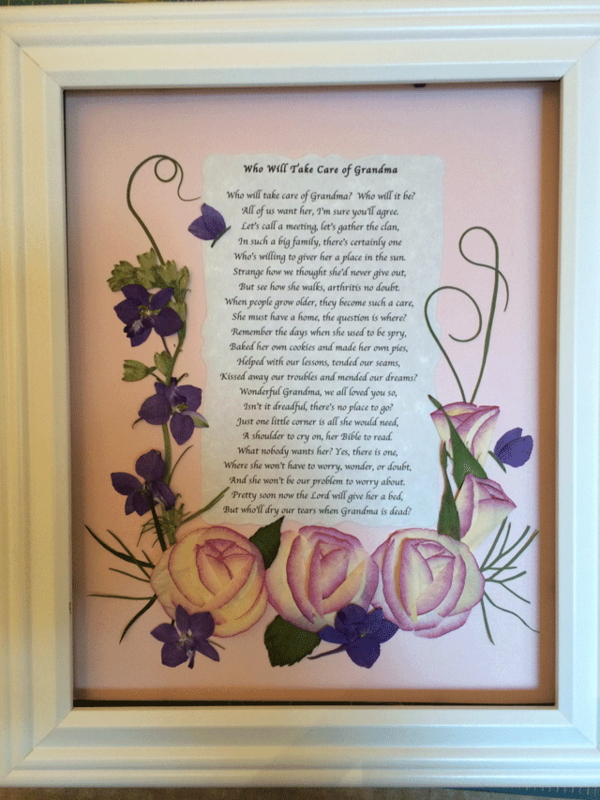 She wanted the flowers from the service preserved in the form of three 11 x 14" framed pieces for her and her two sisters. The white pom pom mum daisies were a challenge to press. They just didn't want to dry and some were starting to turn brown. Finally, I placed the press in my oven after warming it to 170 degrees and then turning it off. After a few cycles I saw a dramatic difference. I mounted each picture in a simple black frame and my customer was extremely happy with the results. I've posted two of the three (unframed) pieces below.